The England Ladies team travelled to Dumfries in Scotland for the inaugural Ladies match against the Scottish national side. The match was played at Loreburn Hall on Sunday 20th January 2019. The England team comprises of players from across the country including Doddington’s Linda White who was selected in the squad for the second year running. England got off to a good start in three sessions of rink games. A 53-50 and 49-46 shot win gave England 4 points to Scotland’s 2 after England being defeated in the third session 56-46. The fourth session of disciplines resulted in 8 points following wins in the singles, pairs & triples. England therefore came away with the overall win – England 12 – Scotland 4. Cambridgeshire county was also represented by Josie Charter of the Fen Drayton SMBC who made the national side for the first time this season. A few weeks of festivities has been a tradition of the club for a number of years now which includes the annual dinner, memorial drive and a festive competition. This year the John Scott memorial drive was the first event in the schedule. This is an annual drive competition played in memory of former club member 'John Scott'. Competitor's played in teams of triples collecting individual shots throughout the evening. The player with the highest number of shots became the eventual winning taking the title and festive prizes. This year the winner was Heather Dale with 30 shots, runner up was John Goff with 28 shots and Judith Fox took the final prize spot in third place with also 28 shots. For the first time the club held its traditional Christmas meal in the village at 'the Three Tuns'. A record number of 40 members and guests were in attendance who all enjoyed a fantastic three course meal. The friendly atmosphere filled the room getting everyone into the festive spirit and the feedback evidently proved it to be a very successful evening. The clubs thanks went to Rob & his team at the village pub for his efforts in making this years meal a huge success and for their support to the club over the year. The final club night of the year was this year a 'Festive Prize Bonanza'. This evening gave all members chance to take home many prizes with over one hundred on offer. Teams of triples competed in the competition scoring the highest numb of shots possible. The higher the score the better the prize. Each team had the opportunity to generate a 12 digit number depending on what happened in each of their games. The fun packed evening also included a complimentary buffet, Christmas raffle, presentation of the years club competition trophies and cheque donation to MAGPAS. The charities representatives Bob & Sue kindly made this years presentations to the winners. The Chairman thanked members for their support throughout 2018 and wished everyone a Merry Christmas. Doddington SMBC hosted its annual Hog Roast & Race Night on Saturday 1st September which attracted a sell-out crowd filling the Village Hall with over 120 racegoers. Eight races were scheduled for punters to bet on their favourite horse. As the bets were being placed the excitement was building around the hall waiting for the races to commence. As the races approached the finishing line the crowd were on their feet cheering on their horse creating a fantastic atmosphere throughout the evening. The special ninth and final race of the evening was an auction race where ticket holders had the chance to buy a horse. One lucky winner walked away with £98.00 as the winning owner. This year the DSMBC Committee & Members were all involved in selecting a local organisation and a charity for the home of this year’s proceeds. Doddington Village Hall were the recipients of the community donation and MAGPAS were once again the charity of the year. The committee are delighted to report that £1076 was raised on the evening and both mentioned organisations will benefit from these funds. This is the most this event has raised so far. A special thanks went to Andy Rose & his team on another enjoyable Hog Roast meal and to Soar Valley Race Nights for another professional evening of horse racing. Congratulations to Linda White on retaining her place in the England Ladies squad for the 2018-19 season. Linda played her first season last year being selected for various games against County and National ladies teams. The club also passes its congratulations to Fen Drayton's Josie Charter for also being selected into the squad for the first time joining Linda as the only two players from Cambridgeshire. Good luck to both in all their games. Thirty years after the club held its inaugural AGM, on Tuesday 19th June members celebrated the anniversary with a drawn triples competition and a complimentary buffet. A playing field of twenty-six competed in the competition which was played over three rounds throughout the evening. The top three ranked teams at the end of the evening were presented with a prize along with the team who held the table up at the bottom. Team F (Jeff Saunders, Judith Fox & Brian Elmore) finished on top winning the competition with 6 points +28 shots. Runners Up were team J (Doreen Butcher & Joe Peters) with 6 points +8 shots. Third position went to team C (Linda Brian & Bill Harrison). A spider competition concluded the evening which was won by Martin Francis. Short Mat Bowls has been a sport available in the village hall as an independently run club since 1988 plus for the short time before this when it was introduced by the Village Hall MC. The club has built itself up to be one of the most respected clubs in the area and recognised nationwide following the success of its members on the Bowls circuit. The club continues to run at maximum membership and it looks forward to the next 30 years providing the local community with not only a sporting but also a social activity. 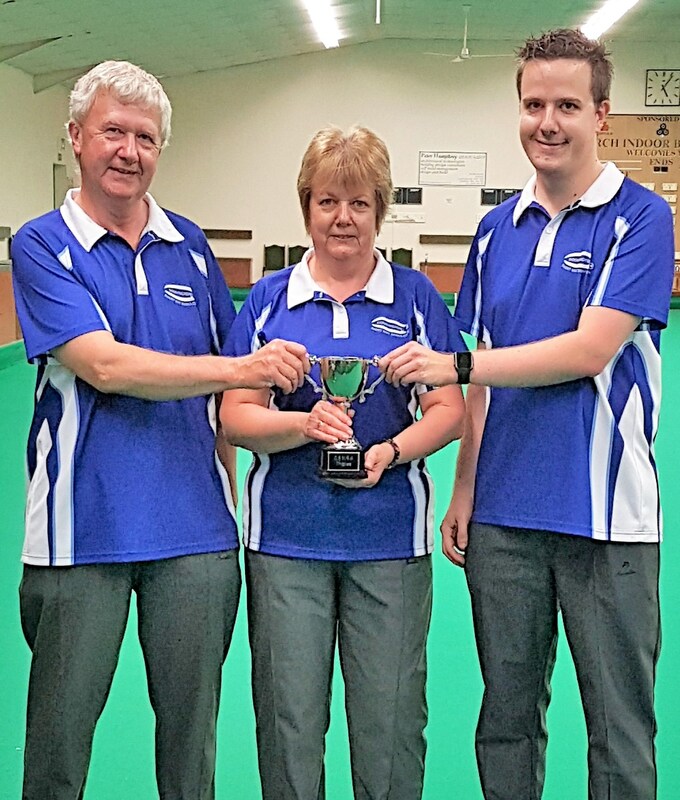 The clubs 30th birthday celebrations commenced on Sunday 6th May when the Doddington SMBC committee invited clubs from the Cambridgeshire area to compete in a special one-off club championship. Ten teams of six bowlers competed, from seven different clubs, in the competition that see bowlers representing their club. Teams played in two groups of five with the top two teams in each group progressing to the semi-final and final. The format of the competition was each team of six played against other teams as two triples. Each individual triple could collect 2 points per win and then 2 bonus points were available for the overall result of both triple games against each club. It was therefore important both teams kept the momentum going throughout the ends to help their other team on the adjacent mat to make sure the bonus points were secured. The competitive atmosphere throughout the day made it even more enjoyable. Refreshments were provided throughout the event along with a complimentary dessert for all competitors. A 30th anniversary pen was also presented to all players at the end of the day. The Winning club received £100 and Runner Up £50. Ten years ago, club captain, Joe Peters set out an ambition to win ten consecutive league titles. Back then this sounded a ridiculous statement to make however as the years went by the dream was looking like turning into reality. With some close results along the way and only winning last season by just one point the division one team are delighted this season to be collecting their tenth title in the clubs 30th birthday year. The ten wins are thanks to several past and present members who Joe selected over the years. The final table this year in this division showed Walpole Highway finished in the runners up place with 82 points compared to Doddington’s 95 points. The division two side finished the season in fifth position however the table was very close with only 5 points separating them and the team in third place. The following day the Pairs was contested which involved two Doddington pairs. 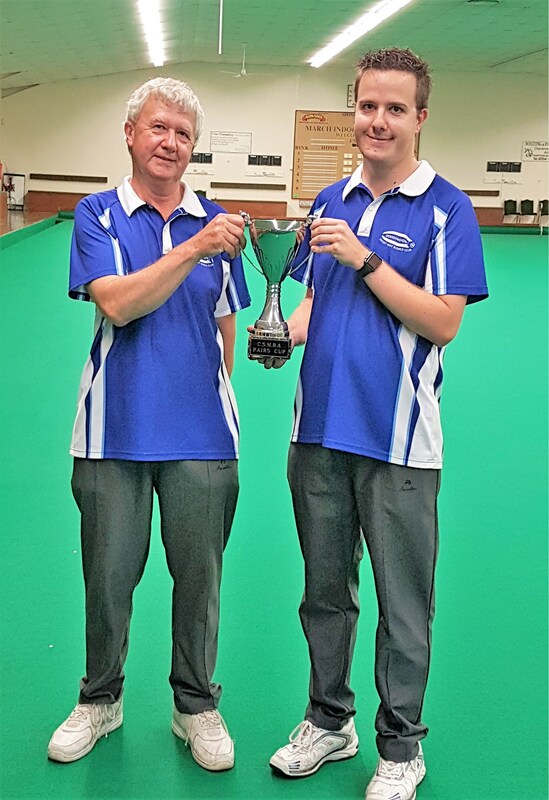 Father and son duo of Rob and Brian Elmore went through to the knockout unbeaten in the group stage winning two and drawing one game. Unfortunately they came up against a hard opposition in the Devon team of Paul Pomeroy & National Singles Winner James Trott losing 12-3. B Harrison & J Peters got off to a good start in their campaign with a 16-2 win but lost the following two games losing out on a knockout spot. The fours was played on the third day of the championships. J Saunders, B Harrison, J Peters & R Elmore were defeated in the first two games against a Kent and Hertfordshire four but the team won the third game 7-5 against a side from Surrey. The Triples completed the disciplines and P Elmore, M Francis (sub) & B Elmore walked away with two wins collecting 4 points in the group stage losing out on shot difference to make the top two to go through to the knockout. L White and R Cooper's triples team (with J Russell of Sutton St Edmunds) were called in leading up to the Nationals following a team withdrawal but unfortunately their hopes were ended in the group stage. 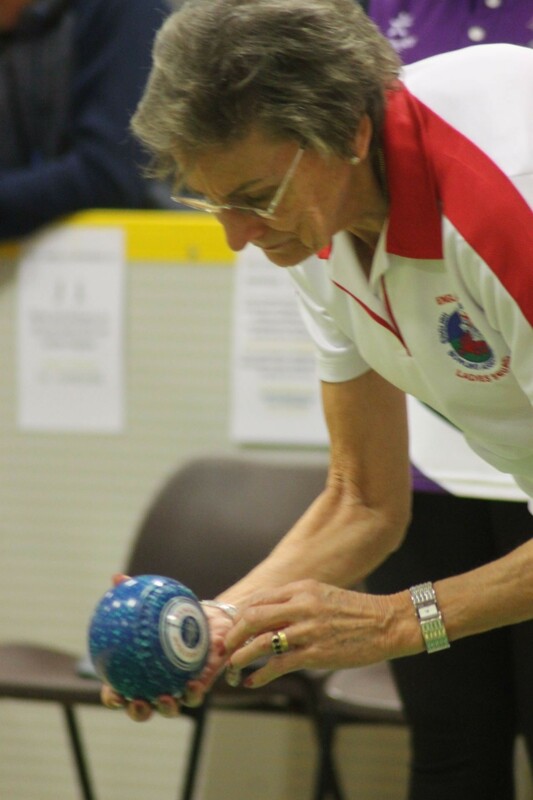 The new Over 55's Pairs event and Mixed Fours finals were held the previous weekend with no success in these events this year. Qualification locally will take place during the summer for the 2019 National Finals. Club member Linda White travelled to Belgium to compete against the opposing ladies side with the England squad. The social media England Ladies Facebook page reported on a successful weekend over the 20th & 21st January. On Saturday the team played at Kotessem with the final result ending 31-17 and on the final day the team renewed their battle with the Belgium Lady Bowlers at the Lembeke Sports Arena winning 34-18. December was a month of Festivities & Competition at the club for all members to enjoy leading up to Christmas. To start with members competed in the John Scott Shield competition on 12th December. The shield, played in memory of former club and committee member John Scott, was attended by 29 club members. The format of the competition is a drive, so all players played three rounds of triples cumulating points throughout the evening. The final results table see Mrs J Goff take the title for 2017 with a score of 30. This was closely followed by R Elmore with 29 points. The third and fourth position had to be decided on shot difference in the matches with three players all getting 28 points. This means M Strang achieved third place and H Stevens was in fourth spot just beating D Butcher to the top positions. The next day 28 Members & 2 Guests enjoyed a three course Xmas meal at The Oliver Cromwell Hotel in March on 13th December. The annual meal is open to all 40 members & their guests so a big thank you to the hotel for hosting the large party which everyone enjoyed. It has been a tradition of the club for many years to hold a Christmas meal as the club closes for the year. To prepare everyone for the big day the final club night on 19th December, with the sound of Christmas music, was a fun packed evening which included a triples competition with over 100 prizes won and basically the more shots scored in each end the better the prize the team won and by the end of the evening every member walked away with something to enjoy over the Christmas period. Also a delicious buffet was provided by the club and supplied by Select Snacks which received fantastic feedback once again. The annual hamper raffle was drawn and this years winner was Ken Carpenter. A number of other prizes were also won following the generous donations from members. Finally the presentations were made for this years club competition winners. Full results can be found under the club competition section of this website. The Chairman was presented with a gift by Ann Pollard on behalf of the membership for their appreciation for the work that he puts into the club over the year. The Chairman then concluded the evening thanking each and every member for their support throughout 2017 and wished everyone a Merry Christmas and a Happy New Year. The club re-opens in the new year on Tuesday 2nd January 2018. The ESMBA launched a new National Competition this year and today (17/10/2017) see the Cambridgeshire qualifier take place in its inaugural year. A number of Doddington players were involved in the competition held at March IBC. The qualifier ended up with a final consisting of Doddington's Janet & John Goff & Joe Peters who teamed up with Sutton St Edmunds Gerry Russell. Following a tie in the initial group games where the husband and wife duo won but Peters & Russell in the end topped the group. 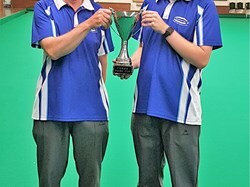 Further stages on resulted in them both meeting in the final where it was a one sided affair with Janet & John conceding at 7 ends of the 9 end game by 9 shots to 0. Cambridgeshire will now be represented at the finals by Peters & Russell. 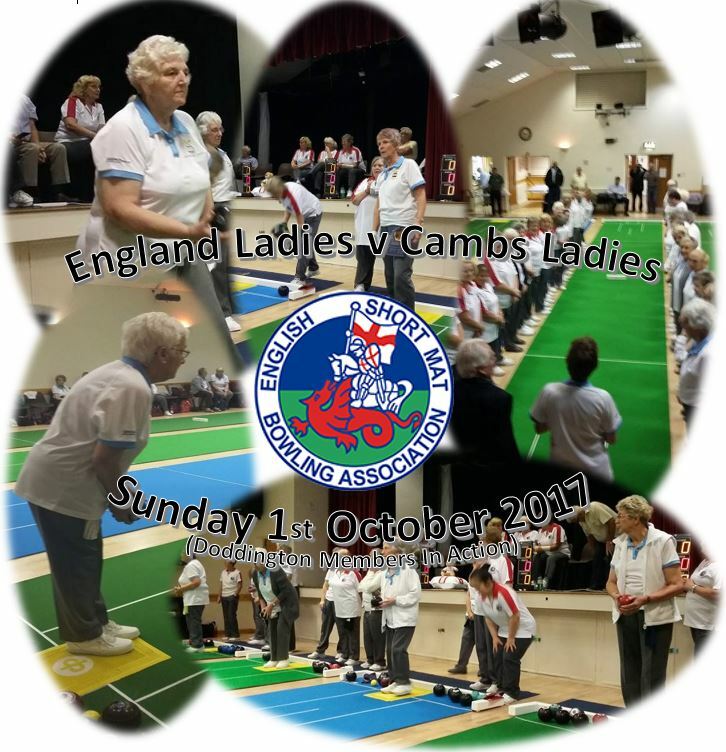 England Ladies performed to their expectations as Doddington SMBC hosted the annual game versus the Cambs Ladies team on Sunday 1st October 2017. The national side defeated the home county by 39-9 points. The Cambs side included a number of Doddington members who all were selected and proud to represent their team. The 9 points included a draw from Doddington duo Ann Pollard & Judith Fox (6-6) which followed a win for Fox in the pairs in the morning session (10-6) along with a win for Pollard in the triples (6-5). Another triple Skipped by Janet Goff and lead by Doreen Butcher had a convincing win (11-3). Goff also teamed up with Jackie Saunders producing a win in the triples (11-2). The final result was disappointing for the home side as expressed in the closing speech by captain Jayne. Despite the loss however she positively spoke of the great atmosphere, competitive manner and great team effort her ladies had played throughout the day. The Doddington members included in the squad were: Doreen Butcher, Rosemary Cooper, Judith Fox, Janet Goff, Ann Pollard, Jackie Saunders, Margaret Strang, Lynda Waple. Linda White also from the club was part of the National line up following her selection for the ESMBA side earlier in the year. Both teams and players exchanged a small gift in the closing ceremony. A disappointing end to the first inter-county game of the season against Suffolk was followed by glory as Cambs defeated Norfolk by a remarkable 29-11 points. 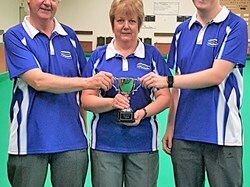 As the Doddington players continue to play more and more competitive bowls, the players are becoming noticed for their consistent play and determination in the game. Captain of the County Men’s team, Joe Peters, started the campaign off with two wins in the singles against Suffolk on 17th September (W 12-11 & W 18-8). This was followed by a win for Doreen Butcher, Janet & John Goff in the triples but they unfortunately lost their other game (W 18-5 & L 9-20). Finally in the fours discipline Judith Fox helped her team to victory in both games (W 14-3 & W 18-5). The following week against Norfolk (24th September) a call up for Rob Elmore in the singles resulted in two wins (W 20-10 & W 12-6) along with a full house from Linda White & Joe Peters in the fours (W 15-12 & 15-12). Butcher (W 14-12 & L 11-12) won one lost one in the triples and Fox was unbeaten with a draw and a win in the fours (W 12-6 & D 10-10). The husband and wife of John & Janet Goff lost in the triples (L 9-14 & L 7-17). Next up is Norfolk away at Hingham on 8th October. Twelve months on from one of the most successful years for members in the county championships, Doddington dominate once again this year by not only defending the pairs, triples and fours crowns but also adding the Singles silverware to the records. This year all four disciplines were played over two weekends in July. A good representation from Doddington gave the club every chance of success. The singles started the campaign and by semi-final stage three members battled it out for the title. B Harrison was defeated by Walpole Highways J Russell & L White lost to J Peters. Last year’s runner up (J Peters) then went that one step further by winning the final against J Russell after a close final. The Fours followed straight after and was organised on a league basis due to the number of teams involved. After all games were played J Saunders, B Harrison, R Elmore & J Peters came out on top winning all games. 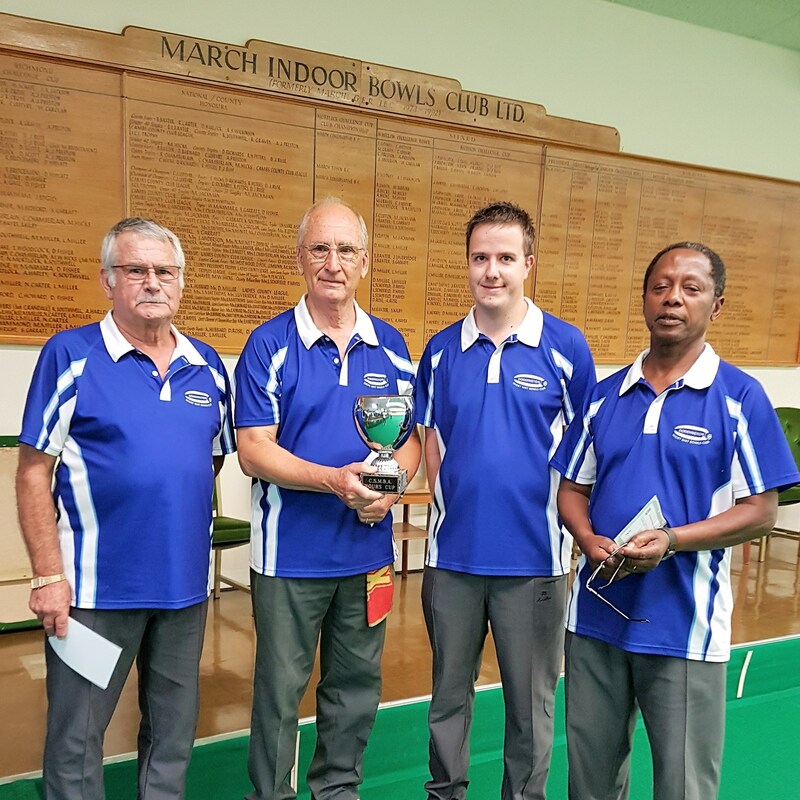 The following week competitors made their way once again to March Indoor Bowls club, which is now the home venue for the Cambs SMBA, to compete in the Pairs and Triples disciplines. The pairs results see all Doddington players in the top three positions with a final deciding the eventual winners between B Harrison & J Peters and B Elmore & R Elmore. The father and son duo came through as winners. Third place went to last year’s winners D Butcher & J Charter. 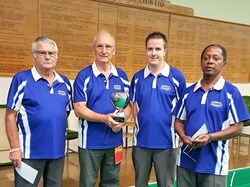 The Triples event concluded the championships and with a number of Doddington teams taking part, the trio of P Elmore, B Elmore & R Elmore won the title for the first time. This years England Trials took place few weeks ago and a number of Ladies from across the country attended the Ladies Trials with the hope of being selected to represent the National team. News was received yesterday that Doddington member and Cambs bowler, Linda White, had been recognised for her performance at the trial and had therefore been selected as a member of the squad for the forthcoming season. The ladies team was formed a few years ago under the management of George Clarke and Linda is the first lady to represent the club and county in the team. Congratulations Linda!!! 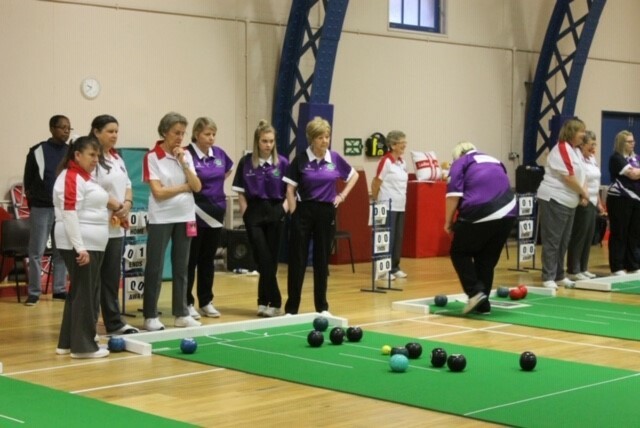 This years National Championships were held at Melton Mowbray Indoor Bowls Club for the first time. The venue is also the home of the Indoor Bowls National Finals and also located next door the EIBA's Headquarters. The main national disciplines were held over four consecutive days at the beginning of the month. Doddington's Doreen Butcher started her campaign on Friday 7th, teaming up with Fen Drayton's Josie Charter who both qualified earlier in the season. All results from the group stage are available under the 'Nationals 2017' section of the ESMBA's website. Unfortunately the duo didn't qualify for the last sixteen knockout stages but enjoyed the experience playing at this level of the sport. Doreen made a second appearance on Sunday 9th in the Triples Championships teaming up with the clubs,husband and wife, Judith & Ray Fox. 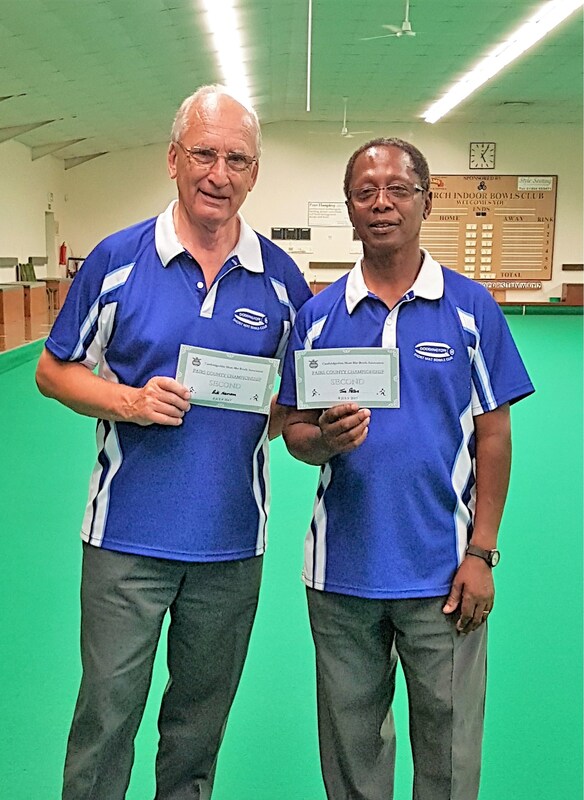 The triple came through local qualification in second place however did enough to qualify following the release of the finals allocations at the start of 2017. The team progressed into the knockout stage of the competition with two wins of 8-6 & 10-8 against East Sussex & Buckinghamshire respectively and a loss by only one shot against Derbyshire which finished 5-6. However the road came to an end against neighbours Suffolk with a 13-3 loss in the last 16. Full details of all the National Results can be found at www.esmba.co.uk . Qualification will start again in the new season in preparation for the 2018 National Finals. Doddington ladies will also be attending trials this weekend (23rd April) for the Ladies England Team. Good luck to all involved. March IBC was the venue for the CSMBA Open Pairs Competition on Saturday (14th January). Doreen Butcher & Fen Drayton's Josie Charter teamed up once again following their National Qualification success earlier in the season to take on the 27 teams in the competition. They were joined by five pairs from Doddington who all set out to win the top prize. Final results see the National Qualifiers win once again finishing on 9 points plus 24 shots, just beating Bill Harrison & Joe Peters who came runners up with 8 points plus 44 shots. Other results from Doddington teams were: J Goff & J Goff 6 points (+9), R Fox & J Fox 4 points (-9), N Jolly & M Strang 3 points (-36) & R Cooper & L White 1 point (-26). Players keep rotating the order of play for the balance of the ends. There were some varied scores throughout the competition setting up a semi-final line up of J Boutle/R Elmore v K Thompson/H Dale (Score 13-3) & B Harrison/J Peters v L Waple & A Pollard (Score 24-0). The final was perfect for the spectators as a closely fought match was played on the Medium pace Mat 4 at the club. Neither team had their name on the trophy until the very last end. Boutle/Elmore led the game most of the way but only by a small margin. A 3 shot count for Harrison/Peters forced a tie and an extra end. Peters drew a back toucher on the extra end putting them favourites to hold on to the end however an over the pace draw by Elmore trailed the jack to the side of the carpet to claim shot but the door was left open for an open runner by Peters who killed the end. The replayed end was once again a very close affair with both teams bowls both leaning on the jack. A slight knock to a front bowl by Elmore did enough to claim the title for Jack Boutle & Rob Elmore. A millimetre gap decided the result of this epic final which ended 9-8. As the club closed ready for the festivities to begin this Christmas time, members enjoyed a festive evening on Tuesday (20th December). A three round Triples competition was played with 105 prizes on offer to be won. For every end scored each team banked a prize. The more shots scored in an end the better the prize so all players had a great chance of taking some festive treats home this Christmas to enjoy. The overall competition winners were S Graham-Cameron, T Hart & R Elmore winning all three games. A Pollard, B Harrison & J Peters secured the runners up spot winning two games claiming the prize with a higher shot difference due to other teams on similar points. In addition to the competition, the club provided a buffet for all members which was followed by a presentation of the club competition winners and runners up awards. This year’s Christmas Hamper Raffle was won by M Strang and members also presented club Chairman, R Elmore with a gift to show their appreciation for the work and dedication he gives the club. The chairman concluded by thanking members for the gift and on behalf of the committee thanking everyone who has supported the club in anyway during the past year. The club reopens on Tuesday 3rd December 2017. The clubs Annual Christmas Meal was this year held at 'The Bow Window' Ramsey on Tuesday 13th December also enjoyed by 31 members and partners. The annual John Scott Memorial Shield Bowls Drive was played in a fantastic spirit on Tuesday (6th December) when 26 Doddington members competed in the shields seventh year. 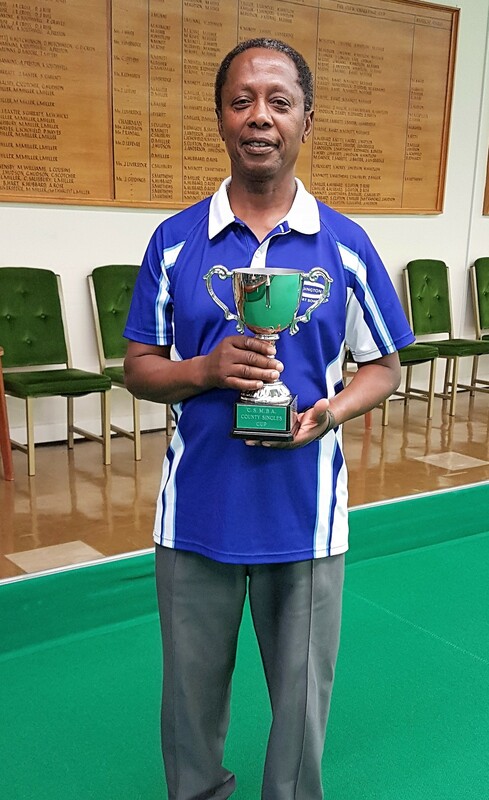 The competition is played in memory of John Scott who dedicated many years to not only the club but the sport of Short Mat Bowls at all levels. All bowlers collected shots throughout their games with the aim to hit the top four prize spots. A score of 17 shots for Judith Fox and Ann Pollard in their first game set the bar high for the other players to catch them up in the remaining games. Judith followed with a 10 shot score in the second game but Rita Payne, Doreen Lowther & Bill Harrison also scored double figures to close the gap with 12 shots each. The third session of games were then to decide the top four positions with some close overall scores at this point in the competition. With Judith and Ann in the driving seats, a high scoring session was required for the other players to take the title. Judith finished the evening off with a 12 and Ann with a 6, but John Goff, Ken Carpenter, Reg Lowther, Pauline Elmore, Ted Croucher put up a good fight with 12 shots each and Rob Elmore & Del Carpenter scored 11 each. However this wasn't enough to catch Judith and Ann who cemented their names in the top positions of Winner and Runner Up respectively. In the absence of Charlie White, Tony Hart presented the shield to the Winner. Charlie & Tony donated the shield to the club following the passing away of John. The season is now well underway for all three Doddington teams in the Cambs League. The Division 1 'Tornadoes' team started their campaign off against a hard opposition in Sutton St Edmunds. The team walked away with a respected 6-6 draw after two wins in the pairs and a draw in a singles and triples game. The Division 2 sides had a home clash during October when the 'Victors' and 'Jaguars' played against each other. The Victors cruised to a 10-2 victory with the Jaguars looking for revenge in the second tie next month. Croucher's 'Jaguars' side put the initial loss behind them and picked up two wins against Gorefield and Tydd St Giles with a 10-2 & 7-5 result respectively. The 'Victors', captained by Doreen Butcher, triples saved the day away at Sutton St James picking up 4 points. The GER away fixture left Doddington with only 2 points but the team picked up 6 points with a home draw in the return match with Sutton St James with a win in each discipline. Overall a positive start to the season and further games are due to be played during November. 17/10/2016 - Joe Peters takes club singles title for 2016. The club singles competition was completed last week with Joe Peters taking the title. Joe came through earlier rounds with some convincing wins leading up to the final against John Goff. John led the way in the early part of the final however Joe pulled back to win with the final score finishing 13-10. Semi-final results see John play Brian Elmore winning 11-4 and Joe winning 13-6 against Pauline Elmore. This years club singles knockout has seen several club members take part who have never player singles before. The competition has given players the experience of a competitive singles match albeit against their club mates but also hopefully given them confidence and encouraged them into playing other competitions. The next and final club competition of the year is the Aussie Pairs competition which will take place in November. 30/09/2016 - Fish & Chip Supper marks the start of the bowls season & Doddington Ladies take on England. The annual pre-season Men's v Ladies match was played on Tuesday and once again proved to be a very popular night . The social evening marked the start of the Short Mat Bowls season where this year the men walked away with the bragging rights. The Triples and fours format included twenty nine members and every shot counted throughout the evening with the team with the highest number of shots overall being named the winners. However it could be said that the score and result was irrelevant as everyone had an enjoyable game which was followed by a Fish & Chip Supper, supplied by Doddington Fish Bar. The food, service and efficiency from the local takeaway was fantastic and the club thanks them once again for their efforts. The evening finished with a Target Bowls Competition with all competitors playing three ends with three bowls scoring as many points as they could. The game turned out to be harder than first anticipated and in the end finished with the ladies just edging the men with the overall points however the individual prizes went to Heather Dale scoring 15 points and Rob Elmore for the men with 23 points. On Sunday 2nd October eight Doddington members travel with the county ladies squad to Tamworth to play against the England Ladies team in the return match. The team were defeated at home by the National side earlier in the year and therefore they will be looking to get revenge on away ground. The club wishes all the players good luck in their games at the weekend. Judith Fox made her debut Sunday (18th September) in playing her first Cambs County game against a competitive Essex side in the first ESMBA ICC match of the season. 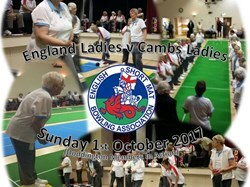 The Cambs squad were at home, where the games are played at the indoor bowls venue of March IBC. The county team, captained by Doddington's Joe Peters, were delighted to win the match 25 points to 15 which sets out the groundwork for another successful season. Joe came out on top in one of the singles disciplines, winning both games 18-14 & 14-11 whilst Tony Hart skipped his four to a 8-8 draw followed by a 12-6 win. Judith was teamed with M Fox, R Bonello & C Buck who won 19-7 & lost 7-14. The second county match takes place on 25th September against Suffolk also at home when the captain will be looking for another win before the team move on to away territory later in the season. Players are selected from clubs across the county to represent Cambridgeshire and make up the 20 player team. 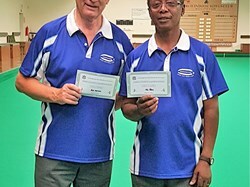 The journey to the National Championships began on Saturday when ten Doddington players competed in the Cambridgeshire qualifying heat of the pairs and triples. The road sends the qualifying team from Cambridgeshire to the next stage at the ESMBA's new venue of Melton Mowbray IBC in April next year. In the pairs Joe Peters and Rob Elmore topped group one to setup a semi final knockout game against club mate Tony Hart and BRAZA's Craig Buck who finished runner up in group two (Score 4-8). Doreen Butcher who paired with Fen Drayton's Josie Charter won group two and played Sutton St Edmunds Gerry and Janet Russell to complete the semi final line up (Score 7-5). With the final being the last hurdle from Melton, the game see a very close score line with Hart and Buck needing a full house to take the game to an extra end. The final finished 10-8 to Butcher and Charter making them qualifiers for the 2017 National Pairs. Congratulations to both Doreen and Josie who will compete on Friday 7th April 2017. In the triples Doddington's Doreen Butcher, Judith & Ray Fox won two games 6-5 & 10-4 but lost the third and Linda White, Rosemary Cooper and Joe Peters won 8-3, drew 6-6 and lost 10-4 in their games. Unfortunately this was not enough to earn qualification and the place went to Rob Bonello, Jayne Thorpe of the GER and Gwen Siggee of the BRAZA Club. The sad news was received today of the passing of former Cambridgeshire Short Mat County Bowler, Norma Betts. Along with her partner, the late Jack Short, they were formally a member of the Witchford and BRAZA Short Mat Bowls Clubs. Norma passed away on 3rd August at the age of 83 at Askham Hall in Doddington. Both Jack and Norma were great supporters of the various open events Doddington SMBC hosted over the years and it was guaranteed their entry to charity competitions at our club was always received within a few days from the form being released. The funeral will be held at Fenland Crematorium on Thursday 18th August at 11.30am. Donations can be made at the service for Parkinson’s UK. Twelve members travelled to the Gorefield Short Mat Bowls Club to play the return match of this years friendly. The evening was played under the format of the Paget league which is a number of fours game played over only 5 ends. A close score line was predicted as the Doddington team had to adjust to the surface and the 40ft mat version of the game. Doddington only had four losing games during the night and collected a total of 82 shots against Gorefield's 48 to leave as match winners. Everyone enjoyed the hospitality that the home team provided with the lovely refreshments and raffle included. Thanks were given to the Gorefield club for hosting an enjoyable evening. Success continued this weekend at the Cambridgeshire county championships. Following last weeks fours win for Jeff Saunders, Reg Lowther, Bill Harrison and Joe Peters, Bill and Joe walked away today with not only the pairs championship trophy but also the triples title teaming up with Reg Lowther. This means 2016 sees Doddington members almost take the clean sweep of county championship titles with a runners up spot in the Singles by Joe Peters. Further details will follow when the scores and other information is published by the county association. Congratulations too all Doddington competitors in these competitions. 02/07/2016 - Success at County Championships. 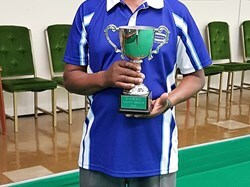 The County Singles and Fours Championships took place at March IBC today and although the competitions were down on entries from across the county this year, Doddington players had a successful weekend. County team captain and previous winner, Joe Peters, finished runner up in the Singles discipline losing out to Tydd St Giles player, Geoff Ward. The fours team from Doddington of Reg Lowther, Geoff Saunders, Bill Harrison and Joe Peters went one further by becoming County Fours champions this year. Congratulations to the winners and all competitors in the event. Twenty two members played in an inter club competition under the format of a double rink event. This format is commonly used in the Indoor/Outdoor game and this evening see it played in Short Mat Bowls. Squads of six players teamed up as two triples and played each of the other teams scoring 2 points per winning rink and then 4 bonus points were awarded to the team winning overall across the two rinks. Once the scoring system is understood and all members are familiar with their teams the format proves to be very interesting. The runners up on the night were Team C which included Bill Harrison, Ian Reay, Jack Boutle, Reg Lowther & Mervyn Judd scoring 16 points. The winners were team D which included Rob Elmore, Keith Thompson, Ken Carpenter, Doreen Lowther, Pauline Elmore and Brian Elmore scoring 2 points. The sad news was received today of the passing of former Doddington member, Muriel Lilley, on Monday 6th June 2016. This news follows the death of her husband Peter earlier in the year. Muriel held various positions for a number of years within the club including Treasurer and Secretary along with Peter who served as Chair and Vice Chair. Muriel served on the County committee and played for the county side during her years playing the sport. Both Peter and Muriel ended their bowling days at the BRAZA club a few years ago after resigning from Doddington in 2005. The funeral will be held at 1.15pm on Monday 20th June at the Centenary Baptist Church, High Street, March , Cambs. Family flowers only but donations will be given to St John’s Ambulance. Our condolences go to the family at this sad time. The ESMBA have released details of this years National Club Championships which was won by Doddington Short Mat Bowls Club in 2010. The format of the event is Singles, Pairs Triples & Fours and a team can include between 6-10 players. The championship will be held at Daventry Indoor Bowls Club on 17th July. Trophies will be awarded and the top eight clubs will be invited to the top team event in Torquay on 6th/7th May in 2017. The ESMBA have tonight announced the sad news and death of former ESMBA Treasurer John Jackson. Doddington players Rob, Ed & Peter were squad members of John's national side during his time as England Under 18/21s Team Manager. John will be sadly missed throughout the country by the Short Mat Bowls community and as the ESMBA say - 'he was a hard act to follow'. The new club shirts made an appearance for the first time in a friendly match against a relatively new and growing club from Gorefield on Monday 5th May. Twelve members travelled from Gorefield to play. Three sessions on four mats of triples played throughout the evening and the final score was Doddington 20 points 118 shots, Gorefield 4 points 62 shots. Although Doddington won convincingly at home, the away side will be looking to get revenge in July when the return match is scheduled. Will the different 40ft length in playing surface at Gorefield, rather than the 45ft length, be a challenge for Doddington who will need to adapt quickly to be in with the chance of taking some points? The club and members are delighted to have taken delivery of their new modern club shirts. The design includes a new club logo with a main colour of blue with a sublimated design and pattern edged with the Cambridgeshire County Sky Blue Colour. The club accepted a grant from the Burnthouse Farm Wind Farm Fund during the 2015/16 season to contribute to the cost of these shirts for the members, creating a fresh look for the club as the players represent Doddington in the various Leagues and Competitions. The last two weeks see the beginning of a number of friendly fixtures arranged for the summer period at the club. Fen Drayton were once again invited for the annual end of season friendly. Seventeen Doddington players enjoyed hosting the twelve player Fen Drayton side. The format of the evening was three sessions of four mats of triples. The final result was 12 points each however Doddington just claimed the win with a 10 shot difference with 83 compared to Fen Draytons 73. The return match will be played at the start of next season. The following Monday (25th) followed a similar format but this time against a team from Three Holes. This is the first time several of the visitors have played at Doddington but again the team, captained by Pam Russell, had a good evening. The final score was Doddington 17 points 118 shots and Three Holes 7 points 61 shots. 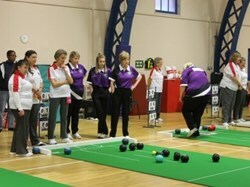 The Cambridgeshire Short Mat Bowls Ladies team faced the England Ladies squad at March Indoor Bowls Club. Well done to the Doddington Ladies selected to play in this ESMBA Presidents Invitation Match. The National side came out on top however the ladies had a very enjoyable day. Doddington members selected were Doreen Butcher, Margaret Strang, Janet Goff, Judith Fox, Rosemary Cooper & Linda White. The team will travel to Tamworth at the beginning of next season to play on an away surface.